“Lets drive north as far as we can go” Begin Part One –> here. 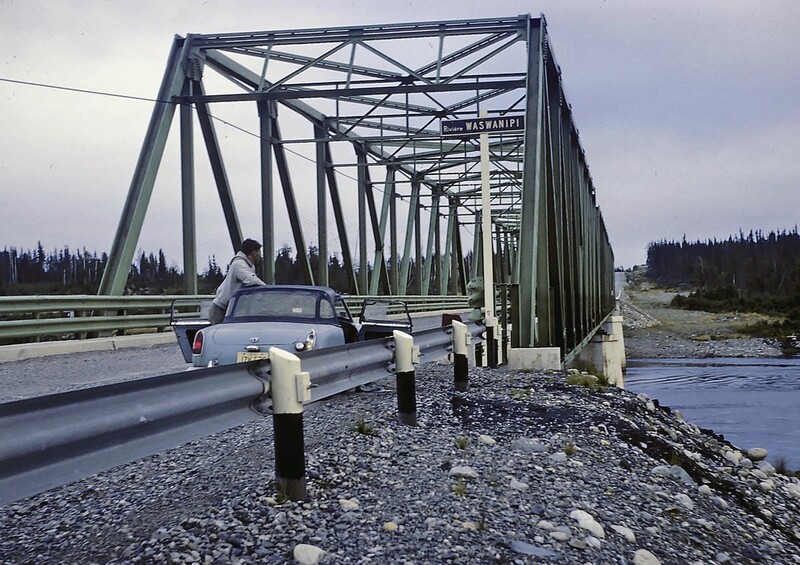 At 3:35 PM, August 31, 1966, Tom and I, in my Austin Healey Sprite, gazed at the long wooden road-barrier before us, and then made a “U” turn to head home. We had traveled 918 miles (1,477 km,) and on a global scale, changed latitude by 9.1 degrees, or about 1/5 distance to the north pole. Longitude changed by a mere 0.2 degrees, almost straight north. Re-tracing our route back 21 miles (34 km,) through Chibougamau again, we turned west onto Rt. 58, (Rt. 113,) on what was the only alternate route back the United States. Information about that road ahead, was sketchy as provided by locals filling our gas tank with fuel. 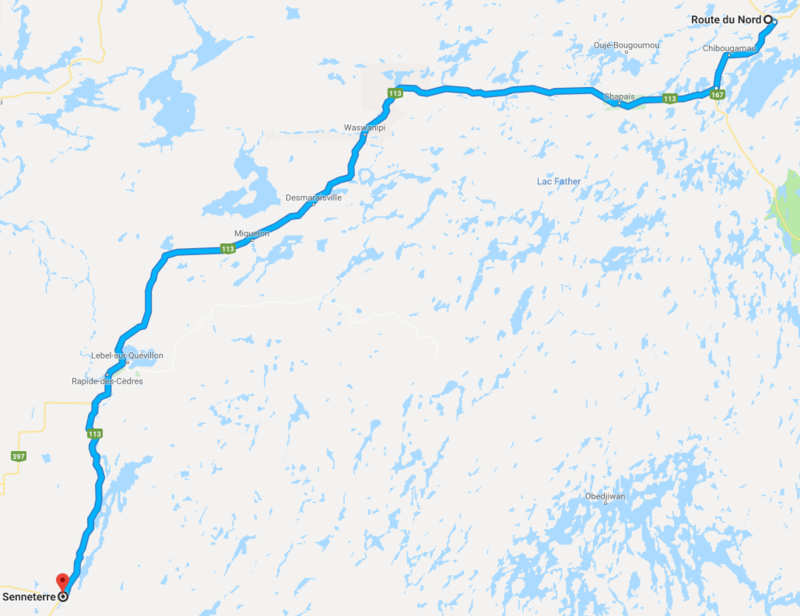 Above: The barrier (Route du Nord) to Senneterre would be 225 miles (365 km) and take about nine hours to sometime after midnight on a route only about 10% paved. Forty minutes after starting on Rt. 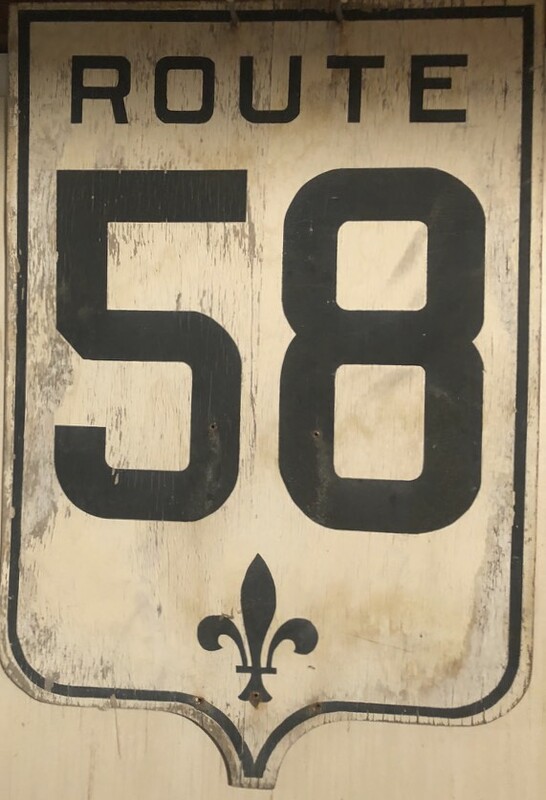 58, we passed through Chapais, the last town of any significance and last pavement we would see for hours. This sparsely populated region was home to the local Cree Indian communities, (see here) known as the Waswanipi. Pausing at this bridge just before sunset in the town of Waswanipi, the road would deteriorate considerably after this crossing. A grueling four or five dusty hours would follow as we moved on into the night. Traveling virtually alone under the northern stars, seeing only a rare passing vehicle, amenities like fuel and light food were available only every 40 or 50 miles (64 or 80 km), although typically for us, a simple request like “ice cream” would prove a bit challenging when asking the well-meaning French-speaking Waswanipi. Every few hours, Tom and I switched drivers, but the primitive road made sleep fleeting at best for the passenger. Having to occasionally pitch in and help free the Sprite from being bogged down in soft ruts proved a little distracting to any kind of worthwhile rest. These conditions were particularly challenging during the last 125 miles (201 km) with our progress restricted to often under 25 mph (40 km.) The welcome return to pavement would finally come near the town of Senneterre, as we continued south just after midnight. 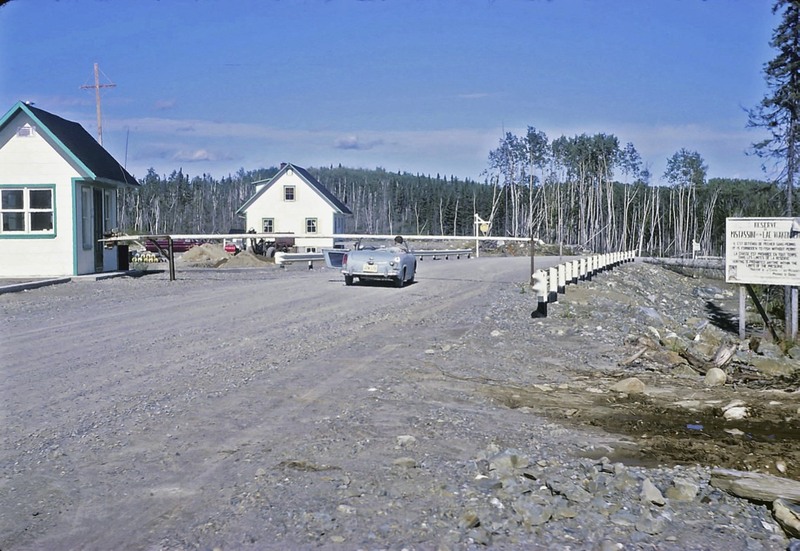 In the following late-night hours, we would drive an additional 100 miles (161 km) along the paved road within La Verendrye Provincial Park, and sunrise would occur shortly later as we reached populated areas about 50 miles (80 km) from Ottawa, Canada. 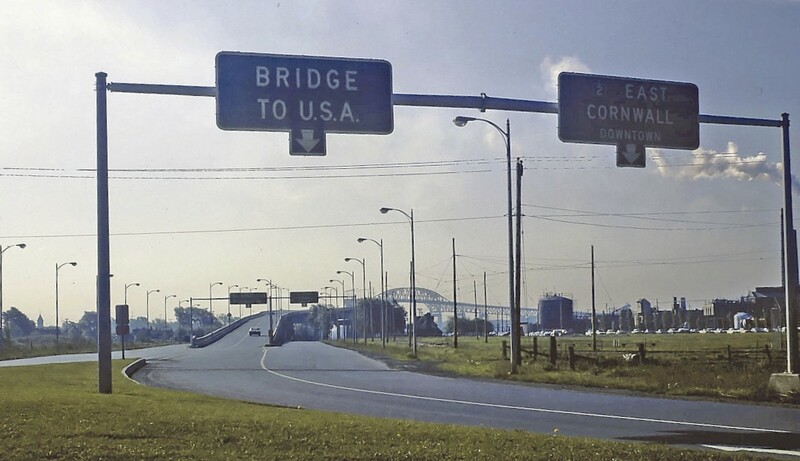 Above: 9:30 AM, approaching the St. Lawrence River at Cornwall, Ontario, and the bridge back into the United States. 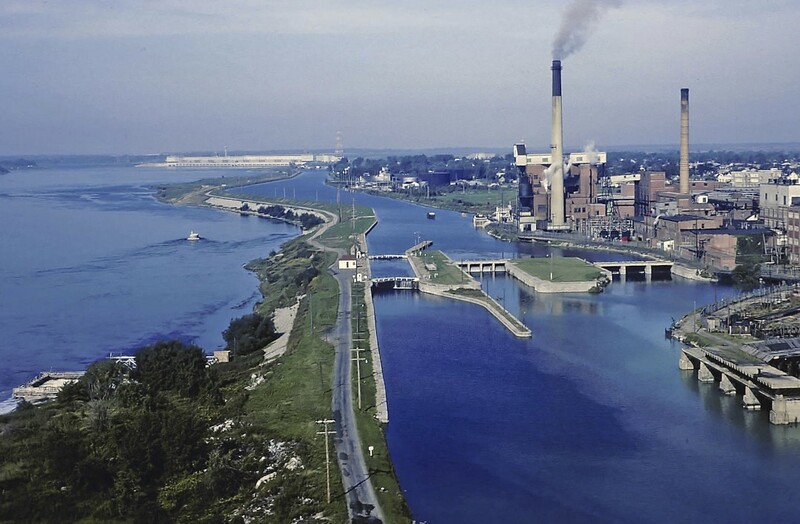 Below: From the bridge, a good view of the locks and Eisenhower Power Plant on the river below, 1,500 miles (2,414 km) into the trip. 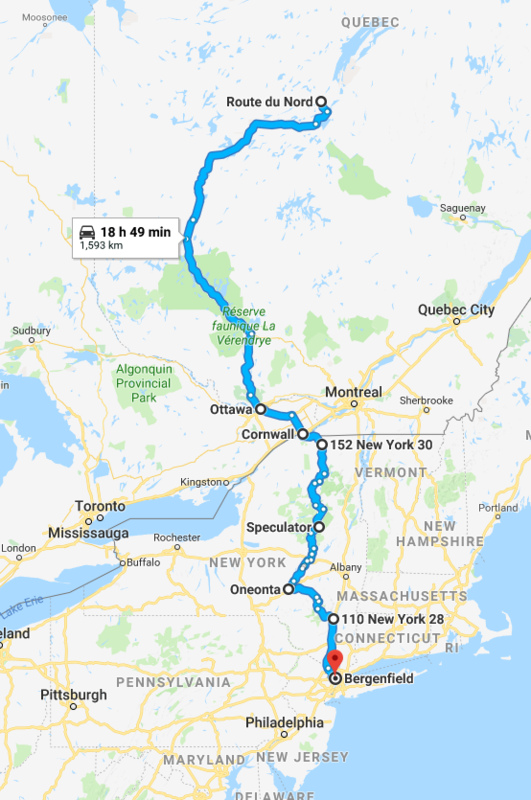 As the air warmed, the top came off the car once more as it would be an additional 11 hours of daytime driving through New York State, including a slight detour to Oneonta, a college town where Tom would shortly be beginning his next year of studies. Note the modern-day Google “travel time” above is based on paved roads, 53 years after the actual 28.5 hours on primitive roads in 1966. 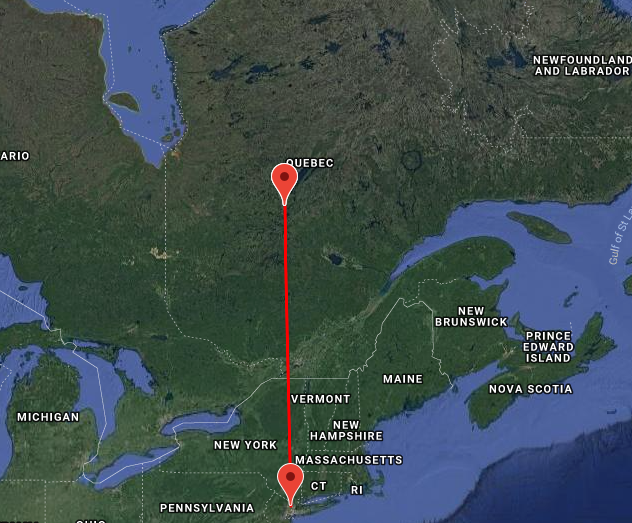 At about 8:00 PM that evening, we would be back in Bergenfield after 1,957 total miles (3,150 km) in slightly less than three days. Our final northern-most point was only about 6 miles (9.5 km) west of directly north, the basic objective of going north as far as we could go by car. wow what a trip! Amazing to think there was no google earth, maps, or Waze. But you did it! Great adventure . . . you should recreate it and document it as you go. I would love to…. today you can reach much further north, and with paved roads and amenities. We would do it much differently, with maybe a small RV and much more time.